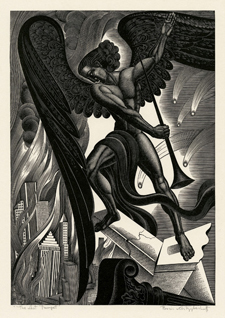 The Last Trumpet - - 1937, Wood Engraving. LC 1. Edition 200. Signed, titled and numbered 68/200 in pencil. Image size 11 5/16 x 7 7/8 inches (287 x 200 mm); sheet size 14 3/4 x 11 1/4 inches. A brilliant black impression, on cream Japan, with full margins (1 5/8 inches); very slight glue staining in the top left and right sheet corners, verso, otherwise in excellent condition. 1937 Presentation Print, Twelfth Publication of the Woodcut Society. ‘The combination of technical excellence, poetic imagination, and the uniquely personal which has made Artzybasheff one of the best known and most admired of American illustrators is characteristically evident in this strongly conceived and strongly executed print." 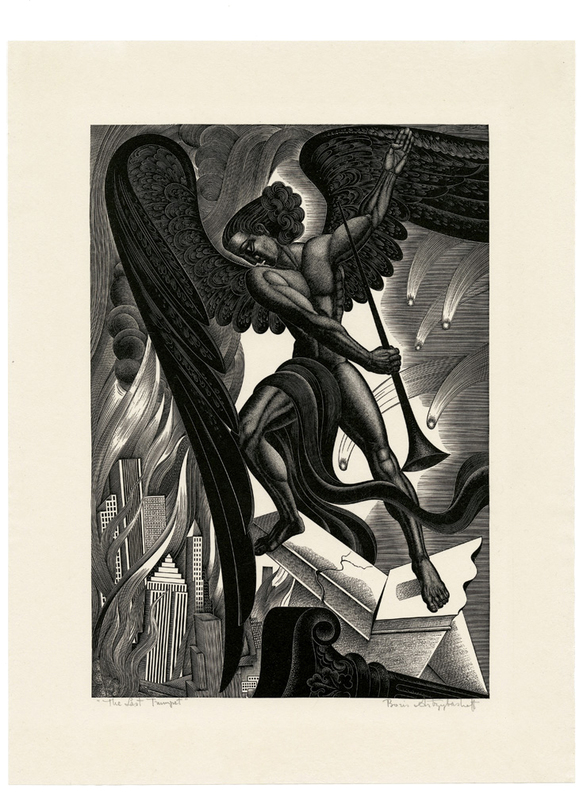 The Last Trumpet –Carl Carmer, The Woodcut Society. Exhibited: Pressed In Time: American Prints 1905-1950, The Huntington Library and Art Gallery, San Marino, 2007-2008. Reproduced: American Prints in the Library of Congress: A Catalog of the Collection, John Hopkins Press, 1970 and in James Swann: In Quest of a Printmaker, Czestochowski, 1990; Pressed In Time: American Prints 1905-1950, Henry E. Huntington Library and Art Gallery, San Marino, 2007. Collections: Art Gallery of NSW, Auckland Art Gallery, Brooklyn Museum, Library of Congress (Pennell Fund purchase), Yale University Art Gallery.